It's all a matter of perception as to how much you'll enjoy a stay at Hillocks Drive Homestead. I'd describe it as a compromise between camping and caravaning. The site is fairly remote, on the bottom of the Yorke Peninusula, South Australia, and requires driving down 19 kilometres of extremely bumpy dirt road once you leave the bitumen. There is also no mobile phone reception so if you're not used to being 'unplugged' from the 'Matrix' (i.e. internet) then this is a great place to discover all those other features your phone has - like the camera. Hillock Drive to Marion Bay. My partner, Enigma, booked our two night trip probably thinking it would be more like a caravan park holiday - even though she knew the caravans had no power. 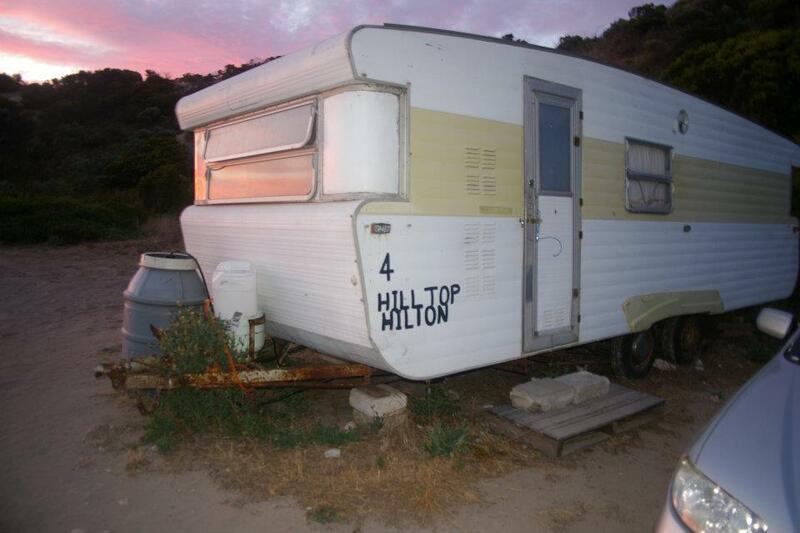 Upon seeing our accommodation she soon realized her expectations were a lot higher than the reality. What you get is a camping ground on the top of the plateau that drops down hill to an extremely pretty fishing spot known as Butler's beach. If you want the premium experience you can book to stay in the homestead as a house guest (we didn't so I can't really comment on this) but the real experience of Hillocks Drive is fishing and for that you need to be on the camping ground near the beach. However being close to the homestead means you're right next to the homestead's shop where you can buy bait, tackle, ice etc. For the budget experience you can book a camp site and bring your own tent or van. The sites are fairly well protected from the wind by the trees and the hillside. You'll be walking distance from a single Eco toilet (or drop toilet as they're sometimes called) and a short drive away from the four hot showers, sinks and flush toilet amenities back at the homestead - be prepared to queue for these if the grounds are busy. Our van - The Hill Top Hilton. Enigma and I went for the mid price experience of staying in one of several caravans, humorously named and distributed around the camp site. Ours was called the 'Hill Top Hilton' and I think it had the best view of the coast from the kitchen window. Most of the caravans look liked they were dragged into place after they went out of style in the 1970's and their owners upgraded. Ever since then they've had patch up after patch up just to make sure they hold together. I think the only thing in our caravan close to new was the mattress on the double bed (which I have to say was pretty firm but comfortable). Many of the windows on our van wouldn't shut properly and the screens were either missing or pushed out (which explains how the spider got in - more on that later). As mentioned there's no power but you do get a gas stove and running water in the sink as well as a single solar powered light - so if you do forget torches you at least won't be sitting in the dark. Now if these vans sound terrible remember, I said it's all a matter of perception. I didn't have any expectations other than I knew there was going to be no power. For me, while the van was the Hilton in name only, it was far more comfortable than staying in a tent - especially on the second night which was quite windy. Enigma's disappointment was not eased by the van not having any sheets and - whilst we bought pillows we hadn't packed sheets. Fortunately a quick trip back to the shop and the homestead's owners, Pam and Lisa, were extremely accommodating and rounded up a set of sheets for us that would normally be used by house guests. 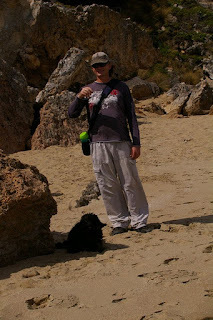 One of the reasons we decided to holiday at Hillock's Drive was that it's dog friendly accommodation. Our little dog Oscar made himself at home in the van and had no trouble sleeping in the new environment. 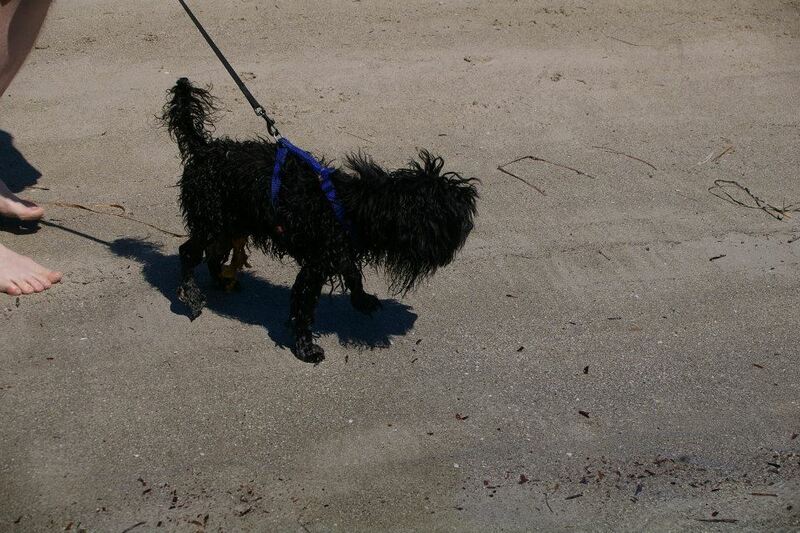 In fact he had the best time out of the three of us - wearing himself out totally every time on the beach, running around and playing chicken with the waves. The presence of a mouse on our first day - which I only saw once as it made a high speed dash between the side of the bed. We heard it again later but made sure there was no food within easy reach. Never heard or saw anything from it after that. Spider I caught in our van. The first night I was looking for a place to hang our lantern torch and happened to find a small hook located conveniently beside one of the biggest Huntsman spiders I've ever seen in a long while. These spiders are quite big and hairy. I don't have a picture but on the right is Oscars impression of it at Marion Bay. Enigma mentioned these incidents to Pam and Lisa who were aware of the Huntsman spider in the van and were quite happy to hear that I didn't kill it (I'm surprised they hadn't named it) but caught it with a glass and put it outside away from the van. As for the mouse they said the traps they set had been empty when they checked them before our arrival. Both of these things didn't really phase me at all. 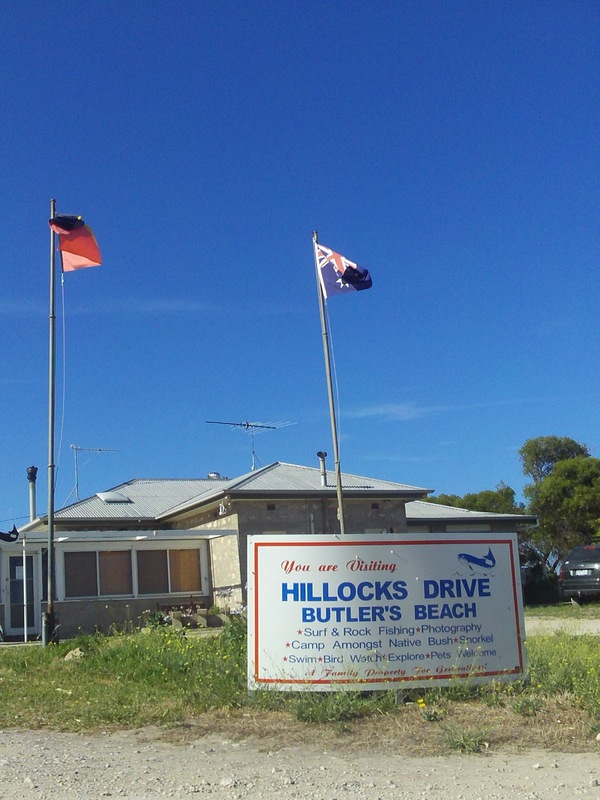 By this point I'd come to realize Hillocks Drive is firmly targeted at people who like to fish from a beach and generally, aren't too fussy about accommodation. Me, I'm just happy to try to make the best of whatever situation arises. I didn't think we'd be spending that much time in the van so the fact that it wasn't actually the Hilton wasn't that big a concern. If part of your holiday experience is about how good the accommodation is then you might want to book a room in the Homestead rather than one of the vans. Aside from Butler's Beach we also went down the coast a bit to Marion Bay, where there is a small township, jetty, boat ramp and a very calm beach. There wasn't too much to do here if you don't have a boat and you've got your pet dog with you but we had a nice time walking along the beach and Oscar got some swimming lessons followed by vigorous rolling in seaweed (which he loves to do). If you don't have pets with you (and Hillocks Drive has a very shady and spacious pen to look after your dog if you need to leave it behind) you can visit the sights at Innes National Park. The park is strictly no pets so we had to turn back. Enigma at Meehan Hill Lookout. On our way back to Butler's Beach we stopped at Meehan Hill Lookout which overlooks a private beach and lengthy stretch of coast line. The sign suggests you're welcome to walk down to the beach but strictly prohibits the use of motorbikes or four wheel drives on the beach. outside the Hill Top Hilton. At this point you haven't really seen any images of Butler's beach. 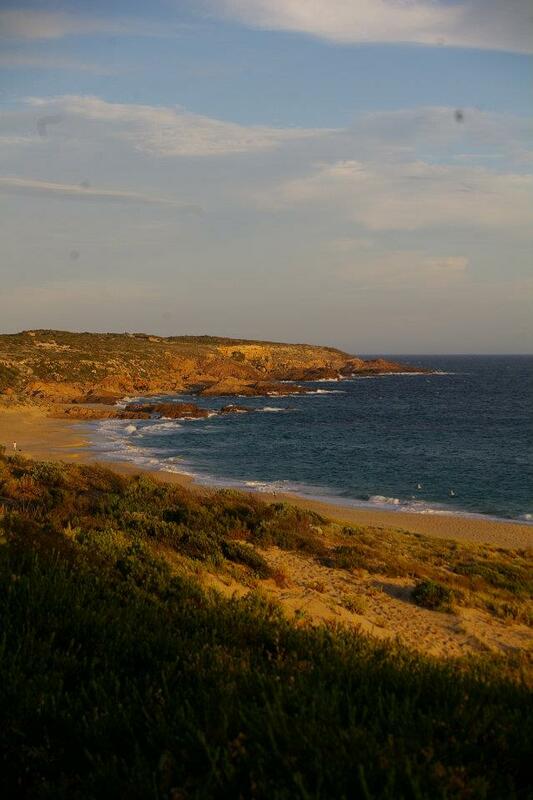 So on the right is a fantastic photo, taken by Enigma, of the beach from just outside the Hill Top Hilton. With a view like this who really cares if the accommodation is a little 'challenging'. I'm not sure how good the fishing is but I did see one family catch a small fish. The mum 'screamed like a girl' trying to pick up the catch and I thought to myself - that's exactly what I'd do too. I'm definitely not a fisherman! You can actually swim at Butler's Beach but be warned it gets deep fairly fast and the waves have a very strong pull - as Enigma discovered with this freakishly big wave in the photo below. One minute she was siting in the wash up that was covering just above her waist, the next she copped a wave in the face! nearly being pulled into the surf by it. 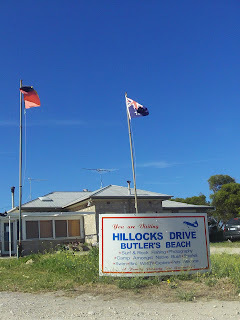 As I mentioned we only went to Butler's Beach, Hillocks Drive for a couple of nights so we didn't do a lot of sight seeing. In fact we spent a large amount of our time on the beach its self. By the time we left I think Enigma was mostly happy with how the holiday went and would've stayed an extra day or so - but neither of us could be bothered to queue for the showers after not having a shower for our whole stay. We kind of wanted to get home to get clean again. caravan park looking back towards the Yacht Club. On our way back to Gawler we made a stop for lunch at the small town of Port Vincent where Enigma had lived for quite a few of the earlier years of her life. According to Enigma the town had changed quite a bit since she lived there though some things were still the same. Unlike Marion Bay the beach and coastline have been developed a little more to create a very pleasant foreshore with parkland, barbeques and a very calm swimming beach. Enigma and I contemplated possibly spending a future holiday here - perhaps in the caravan park right on the beach (with power and self contained units). Dare to dream. Oscar and I at Butler's Beach. Overall, whilst this holiday was definitely a bit of a challenge on the accommodation side of things, I think if we had known exactly what to expect (and in hind sight), we'd still both have gone. I know Oscar would be there in a second. He didn't seem to be that much of a beach fan when we took him to our local beaches but he really took to Butler's Beach despite the strong swell and windy conditions. He's definitely a beach dog now! There's just something about spending a vacation at a relatively undeveloped beach that catches my fancy. The trailer homes just add a nice little flavor to this one. More beaches should be kept like that - as in just the way they are or with minimal development. I have seen some that have been over-developed and all I can say that they just don't look the way they used to. Hillocks is a fantastic bush camping area. The beaches are so clean, the water crystal clear, several rock pools for swimming are the best I have ever seen. Being able to have a campfire at night just tops off the whole experience and being able to take our dog. Great post! Happy to find your article.